And now for something completely different: Despite being an adaptation of a comic series, Guardians of the Galaxy represents a risk and a departure for Marvel by basing a major summer would-be blockbuster (and hopefully a new film franchise) around a band of heroes who aren’t household names, and sending Marvel’s film adventures into space. The resulting product is sufficiently quirky and far off the beaten path to leave it to be seen how well mainstream audiences will take to it, but Guardians of the Galaxy is engaging for the most part, and also represents something different from your run-of-the-mill comic book superhero movie. There’s maybe a dash of Star Wars, and at least in the oddball tone, maybe a pinch of a more coherent The Fifth Element, but overall this isn’t that much like anything we’ve seen before. After an Earth-based prologue in 1988, with young Peter Quill (Wyatt Olef) witnessing his mother’s death of cancer in the hospital, running outside in grief, and being promptly snatched up by an alien spacecraft, we jump to the present day but definitely a galaxy far, far away. Quill (now played by Chris Pratt), also known by his self-legendizing nickname “Star Lord” (which, to his chagrin, no one has ever heard of) is a thief, outlaw, and all-around scoundrel who, a bit like a somewhat more bumbling Han Solo, travels to distant alien worlds seeking exotic valuables for the highest bidder. But Quill sets his sights too high when he steals a mysterious orb. It turns out the orb holds unlimited power, and several parties want it in their possession, including The Collector (Benicio del Toro), who covets all rare items, Quill’s pissed-off adopted family of pirates and smugglers (led by Michael Rooker), and most threateningly the terrorist Ronan (Lee Pace), who wants it to obliterate his sworn enemies, the Xandarians. After a narrow escape from Ronan’s henchmen (led by Djimon Hounsou), Quill gets in a three-way scuffle with Ronan’s henchwoman Gamora (Zoe Saldana), who is actually seeking to betray him and keep the orb out of his hands, and a bizarre pair of bounty hunters, a surly, trigger-happy, talking raccoon called Rocket (voiced by Bradley Cooper), and a towering, tree-like being called Groot (voiced by Vin Diesel), whose vocabulary consists entirely of “I am Groot” (though, like Han Solo and Chewbacca, Rocket can somehow extrapolate more meaning from Groot’s utterances than anyone else). After all getting arrested and thrown in an interstellar prison where they make the acquaintance of hulking Drax (WWE star Dave Bautista), who is seeking revenge against Ronan for the murder of his family, the oddball gang become uneasy allies to make their breakout and collect on a hefty payout by selling the orb to the Xandarians and keeping it from Ronan. Of course, along the way, each of this motley crew uncovers a little more heroism than they knew they had. The basic plot of Guardians of the Galaxy is simple, even simple-minded, and the whole backstory–Ronan’s motivations, the tension with the Kree and the Xandarians–is thinly-developed to the point of leaving Ronan a thin and shallow villain and not making it as exciting as it’s supposed to be to see our heroes race against time to save a world and civilization we’ve barely seen, even when this culminates in a climactic battle royale. There’s plenty of action, including the closing large-scale space battle that would feel at home in Star Wars, and a hand-to-hand duel between Gamora and her evil sister Nebula (Karen Gillan), who is loyal to Ronan, but most of it’s not especially memorable. On the other hand, the main characters develop a nice rapport, the dialogue crackles with rapid-fire wit, and the movie maintains a tone of cheerful irreverence. Calling Guardians of the Galaxy an action-comedy might be stretching it, but not by much. An extra dash of quirkiness is added by the soundtrack of ’70s and ’80s pop hits provided by Quill’s cassette player, one of the few possessions he had on him during his childhood alien abduction. The movie boasts pervasive CGI on the level of the Star Wars prequels, but the oddball tone is a closer cinematic cousin to The Fifth Element. It’s certainly the only movie you’re likely to see a gun-toting talking raccoon, or the hero distracting the villain from activating his doomsday weapon by singing and dancing along to “O-o-h Child”. Various plot elements—most notably the behind-the-scenes “big bad”, Thanos (a cameo from an unrecognizable Josh Brolin), clearly being set up for a more prominent role in later installments—are left unresolved for the already-in-the-works sequel, but the main story is self-contained enough that the movie doesn’t feel incomplete. The cast is well-chosen, and isn’t made up of overly familiar faces. Chris Pratt, a fairly fresh face on the big screen and best-known for his role on the television comedy series Parks and Recreation, who dropped some fat and gained some muscle for his role here, plays Quill a little like a cross between Chris Pine’s Captain Kirk and a more bumbling Han Solo, but without feeling too much like a clone of either. Quill undergoes a standard-issue arc of a “scoundrel with a heart of gold” who becomes a hero, but Pratt plays it with enough irreverence to keep it from feeling tired out. A green-skinned Zoe Saldana, who between this, Star Trek, and Avatar, is getting plenty of practice playing the tough sci-fi action heroine, is suitably badass as Gamora, and she and Pratt generate a little sexual tension, although their “romance” doesn’t make it past the flirtatious stage (at least not yet). Bradley Cooper provides the lion’s share of the comic relief, even though only his voice is present onscreen, while Dave Bautista also gets his fair share, and Vin Diesel has little to say besides slight variations of “I am Groot”. A blue-faced Michael Rooker is his usual self (but gets a cool weapon), while John C. Reilly has a smaller role, an almost unrecognizable Benicio del Toro basically drops by to deliver exposition, and Glenn Close has essentially a glorified cameo as the head of Xandar’s military. The weakest link is the shallow and ho-hum villain; between being buried under makeup and relegated to one-note ponderous speechifying, Lee Pace’s Ronan comes off like the brother of Christopher Eccleston’s terminally underdeveloped Malekith from last year’s Thor: The Dark World, and like Malekith, Ronan mostly comes off like an obligatory plot device to propel the action. Thanos’ voice and motion capture performer Josh Brolin is more imposing in his brief appearance, which is a bit like the Emperor’s mysterious, shadowy cameo in The Empire Strikes Back. Guardians of the Galaxy has cheesy moments, but most of the corny humor is obviously intentional, and by clearly never taking itself too seriously, it manages to get away with it where it would have been more jarring in a movie that played things more “straight”. It’s not terribly substantial (though neither is the massively popular Star Wars), but it’s fast-paced and throws in plenty of action, the characters have a great rapport, and the dialogue sparkles with rapid-fire back-and-forth one-liners. Among the many generic comic book superhero movies ever increasingly saturating today’s film landscape, it’s sufficiently different and unconventional to set itself apart and be a blast of refreshingly off-the-beaten-path and irreverent summer entertainment with a sense of cheerful wackiness all its own. 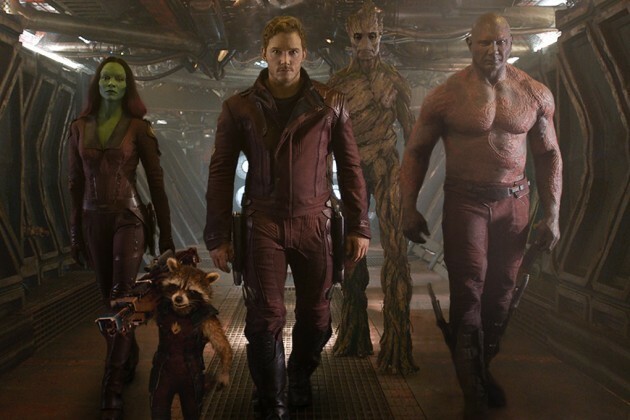 Guardians of the Galaxy isn’t perfect, but it’s a fun and appealingly quirky ride.